The Lake Monsters' 2015 computer drive was featured in the Lake Oswego Review. Photo credit: Vern Uyetake, Lake Oswego Review. The Lake Monsters were grateful to be featured in an article in the Lake Oswego Review. 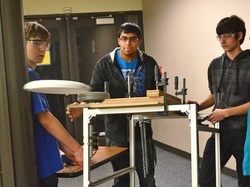 It was a great piece about the team and the role of FIRST in increasing opportunities for students to learn about STEM. The Robo Girls on the Lake Monsters team were featured online and in print in The Oregonian. 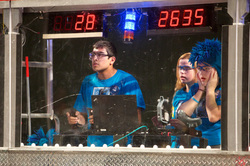 Kristin Taylor (left) helps Stevie Hillier solder electrical wires for the team robot (photo credit: Julia Seydel).